"I really loved this book. Asimov would be proud." Candy Calvin has it all. She’s a respected robopsychologist who specializes in the care and feeding of robots, particularly those belonging to Los Angeles’ wealthy elite. Her best friend Susannah helps Candy run her practice. The only thing Candy is missing is someone special with whom she can share her life. Until one day, on a whim, she visits an online dating site. She soon finds a profile she likes: ROBOSTUD2047. They agree to meet for dinner. 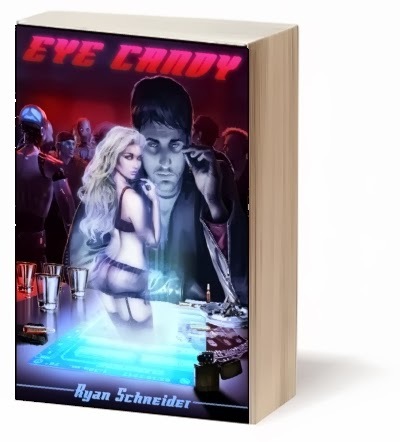 But when Candy lays eyes on him, she gets more than she bargained for, including a trip into orbit, a midnight ride in a ViperJet, and a revelation that rattles her to her core. Danny Olivaw is a renown roboticist famous for his books on the inner workings of artificially-intelligent beings. When he’s not writing, he flies his jet and hobnobs with celebrities and movie stars. His roommate Floyd is a screenwriter and actor who convinces Danny to try online dating. EYECANDYPh.D.D. immediately catches Danny’s eye. They agree to meet at Chateaux Pizza and before Danny can get over the statuesque beauty before him, she’s sampling his bruschetta and tasting his wine. Danny knows instantly that he’s head over heels for Candy. But things aren’t always what they seem, and Danny soon finds himself in a downward spiral in his quest to reunite with Candy. Packed with action, comedy, romance, and an ensemble of lovable characters, EYE CANDY is an uplifting roller coaster ride in the time of robots. I believe a story should entertain you, inspire you. Make you think. Make you feel. That's why I wrote Eye Candy. It is now available worldwide. "RYAN"....have been an above-average Sci-Fi and Sci-Fact fan and follower...for over 60years, etc. Yes indeed...Just reading the "info herein....gave ME a few 'somewhat New or Updated Innovative Ideas' relative to some Concepts, etc....and That "I" do really appreciate! Thanks! That is an interesting suggestion. I DO happen to have some ideas for additional stories in the Eye Candy universe... Some directly related, and some involving supporting characters.